Luxury Swiss watchmaker, Baume & Mercier creates Riviera XXL High Jewellery watch for elegant woman. The unique model beautifully illustrates the elegance of the RIVIERA line. The watch is an ultra feminine interpretation and skill-fully aligns femininity. Baume & Mercier always plays with the theme of transparency; the Swiss watch company has successfully risen to the challenge of combining femininity and prestige with the line’s signature twelve-sided design. This high jewellery interpretation of the Riviera XXL High Jewellery watch magnificently illustrates the very essence of glamour and refinement. 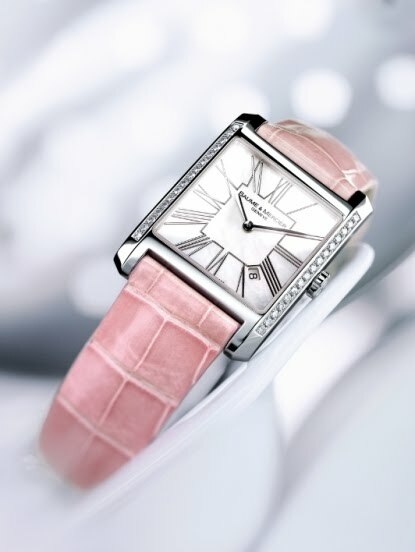 In keeping with the spirit of the line, the Riviera XXL High Jewellery watch jumping Hour collection maintains the distinctive features of the Riviera XXL High Jewellery watch, Its double twelve-sided bezel, secured by 4 gem-set screws, is clothed in white gold for the black version, while sapphire crystal highlights the radiance of the gold on the pink and white versions. Further enhancing the precious and exceptional nature of this timepiece, the opulent shapes of the white gold case are set with 400 brilliant-cut diamonds totaling 9.5 carats.